I arrived back in Melbourne from Auckland in 2012 after a few years away. Being a musician, I immediately moved to one of the suburbs soaked in live gigs most nights of the week; Northcote. I had run fundraising poetry and music gigs back in New Zealand and I was keen to get back into it. Open studio was the first venue we booked and it was just the right vibe for the Kerouac Effect, with its French/bohemian style and intimate vibe (and delicious crepes!). We matched up poets and musicians and it was a delightful night. At that stage I was surrounded by amazing, talented women who played piano and wrote their own songs and I thought it would be great to run a monthly showcase, hence the name “Girls on Key”. It was literally Women who played piano. Because I wasn’t as well-connected to the Melbourne music scene as I used to be, it was a small gig, with limited success in terms of bringing a crowd out on a week night. 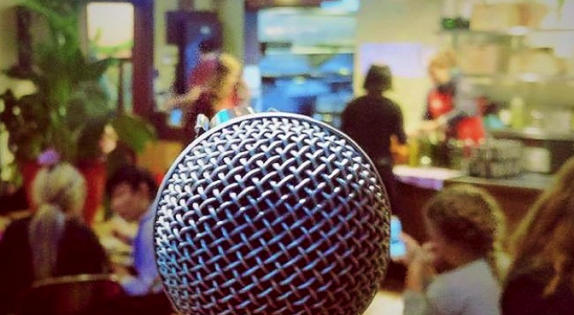 In 2014, I decided to run a poetry special of the event and, surprise, surprise, Melbournians really enjoy their poetry and spoken word, so the gig started to grow. People seemed to be on board with the idea of contributing to refugee causes through the door charge. The philosophy behind my fundraising gigs was to always support the artists through payment, but also send a portion of the door funds to a worthy cause. Currently we are supporting the Syrian Refugee crisis appeal. It gives me great pleasure that we are able to have a good time on the night, but also give to those in need. To me, it’s an absolute win-win situation and I am happy to report that it is now sustainable. For me, the vision has always been to blow people’s minds about what poetry can be, from slam and theatre, to reflective published work. We are a diverse community and I hope to celebrate women and queer writers, who tend to be under-represented as features across events. I think this is changing, and I’m glad to be a part of that. Empowering women in the arts through opportunities is vital, if we are to move toward a fairer and more equitable society. I feel very lucky to be in a space and time where I can be involved in this. I have some sneaky ideas and visions of where we could take it. But it has grown really organically and has turned into a very supportive and dynamic community of people.